We are pleased to offer the complete range of genuine Hydrotech replacement reverse osmosis membranes for all Hydrotech brand RO systems. If you are unsure which membrane is used in your system, check your current RO membrane for a white sticker which will indicated the membrane type (TFC or CTA) and a number which indicates the membrane capacity (9, 15, 25, 35, 45, 50, or 75 GPD). We are also pleased to offer a Best Price Guarantee on all Hydrotech reverse osmosis membranes. We will meet or beat any competitor's advertised price at time of original purchase. Please call us toll free at 1-866-376-2690 to request a price match if you find a competitor with a lower price. Please note that price guarantee applies to competitor's price including shipping at time of original purchase only. red band Hydrotech Models: 101, 102, 103 Series, 10103, 10203, 1240 Series, 1240 E Series, 240 M Series, 1240 Pro Series, 4VTFC9G, 4VTFC9GPB, F-HT-9, F-HTF-9, and more. Replaces membrane model 41400003 (green w/ red band). blue band Hydrotech Models: F-HT-25, F-HTF-25, 101 Series, 102 Series, 1240 Series, 1240 E Series,1240 M Series, 1240 Pro Series, 3VTFC25G, 4VTFC25G, 4VTFC25GPB, and more. Replaces membrane model 41400005 (green w/ black band). white band Hydrotech Models: F-HT-50, F-HTF-50, 1240 Series, 1240 E Series,1240 M Series, 1240 Pro Series, 3VTFC50G, 4VTFC50G, 4VTFC50GPB, and more. black band Hydrotech Models: F-HT-75, F-HTF-75, 1240 Series, 1240 E Series,1240 M Series, 1240 Pro Series, 4VTFC75G, 4VTFC75GPB, and more. black band Hydrotech Models: F-HT-25, F-HTF-25, 101 Series, 102 Series, 1240 Series, 1240 E Series,1240 M Series, 1240 Pro Series, 3VTFC25G, 4VTFC25G, 4VTFC25GPB, and more. This membrane has been replaced by membrane #33001068 above. 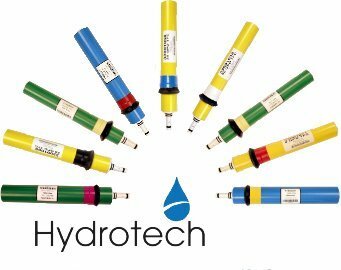 yellow band Hydrotech Models: F-HT-15, F-HTF-15, 10304, 103 Series, 1240 Series, 1240 E Series,1240 M Series, 1240 Pro Series. This membrane has been replaced by membrane S-FS-07, #41400004 above. We also recommend that you change your pre-filter to the combination sediment/carbon filter #41400076 to protect the membrane from chlorine if you are on a city water supply.